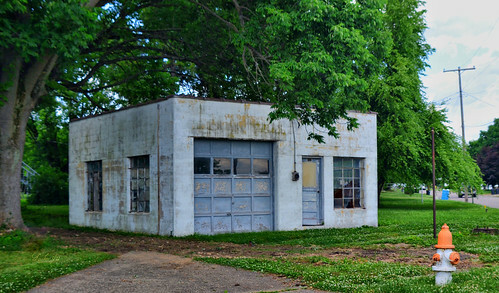 The owner of this little filling station told me that this was built as an Amoco station, later changing to Ashland Oil. The building held a small grocery store and boasted a garage with a grease bay. The gas tanks are still in the ground (filled in), and the remains of the two pump island is still there. Gasoline was last pumped in the early 1970s and the building hasn't had electricity since sometime in the early 1980s. A wonderful throwback in time, found in Belpre, Washington County, Ohio.